Children's daily multivitamin and mineral, naturally flavoured and no artificial colours. 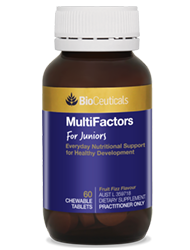 MultiFactors for Juniors provides a blend of vitamins and minerals to support the healthy growth and development of children’s skeletal, immune and nervous systems. maintenance of healthy bones and teeth. 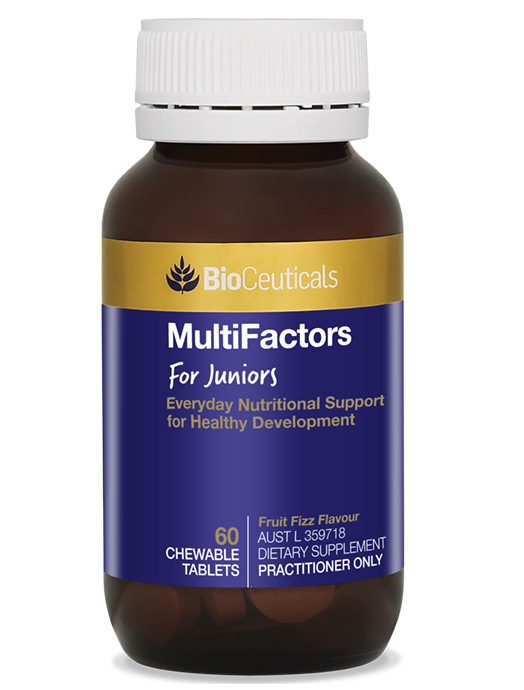 High doses (above RDI) of the B vitamins, vitamin C, vitamin E and chromium. Contains lysine, which plays a role in calcium metabolism and tissue synthesis. Natural mixed “jungle juice” fruit flavour, naturally sweetened with tooth-friendly xylitol and stevia. Children 2 years and older: Chew 1 tablet once to twice daily with food or as directed by your healthcare practitioner.